When we talk about the distinctive architectures and skyscrapers around the globe; the first place that catches our attention is undoubtedly Dubai. Dubai is highly acclaimed for its lankiest skyscrapers, and most imperatively all of them reflect the brilliance of structure, design, technology and architecture that are used to construct the tallest buildings in Dubai, specifically over the desert sand. These high-rise buildings and towers also add great value to Dubai tourism as people come here to enjoy the sights of these skyscrapers and relishing their inner world. 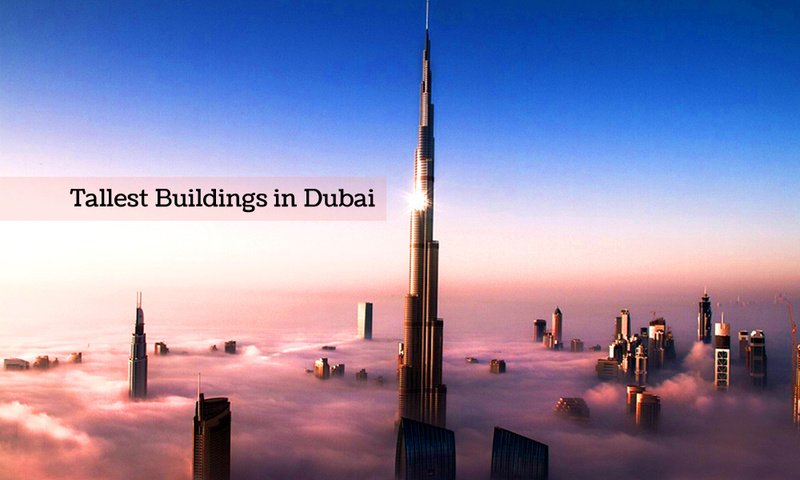 Visiting these tallest buildings in Dubai is also one of the recommended things to do in Dubai for tourists. Dubai is the dynasty of 911 finished skyscrapers, of which 18 are taller than 984 ft (300 meters); 88 stands higher than 591 ft (18 meters) and 73 stands lankier than 656 ft (200 meters); that is actually loftier, higher and taller than any other city in the world. The city proudly holds the title of being the home ground of world’s tallest building – Burj Khalifa; world’s tallest hotel – JW Marriott Marquis and world’s second, third and fourth tallest residential towers – The Princess Tower, 23 Marina and Elite Residence respectively. It seems like building sky-high infrastructure has become a passion of this conurbation. Since 2012, the city has over 640 active multistory developments, some of which is expected to break the existing records. For instance, Marina 106 will become the tallest residential skyscraper on its completion in 2016. Here is the list of the top 10 most famous and the tallest buildings in Dubai, that have now taken as the individuality of Dubai and has become the focus of tourist attraction. The highest megaliths of Dubai are mentioned below with respect to their heights. Burj Khalifa is bigheadedly holding the title of the tallest skyscraper in the world since 2009. It is the tallest man-made architecture across the globe. The project got successfully completed in the duration of 62 months (Sep 2004- Oct 2009). The total construction value of Burj Khalifa was estimated to be US $ 1.5 bn. This high-rise megalith got commercially opened on January 4th 2010. Burj Khalifa is situated in Downtown Dubai and has an associated entry opening from the Dubai Mall. Burj Khalifa is not only the tallest building in Dubai but the whole world as well. The Princess tower is the second tallest residential tower in the world proceeded by 432 Park avenue situated in New York City. It was considered to be the tallest within the category till 2012. The Princess tower is the pride of Dubai Marina and it is comprised of 763 housing units and 957 bays for underground parking. The tower got successfully accomplished during a span of 6 years and propelled commercially in 2012. It is the highest building in Dubai with an amazing view. 23 Marina Dubai is the third tallest housing tower in the world preceded by the Princess Tower. The building has total 92 floors, of which 4 are underground, whereas the rest 88 stand above. It has 289 housing divisions and attached swimming pools and lifts with each luxury duplex. The tower has 62 high-tech elevators. The project magnificently got accomplished in a period of 6 years (2006-2012). With 685 apartments, the Elite Residence Tower is the third largest dwelling project in the world. The building actually has 91 floors, of which 76 are dedicated to residence, 11 for facilities; whereas the rest 4 are underground. Each housing unit is encumbered with numerous amenities and luxuries such as spa, beauty salon, swimming pools, health clubs, business avenues, reception services, gymnasium and parking, etc. The project was commenced in 2012 and got complete in a span of 6 years. Almas Tower was formerly the tallest building in Dubai before Burj Khalifa. Currently it is the tallest administrative building of Dubai. Located over its personal non-natural island, it is situated in the middle of Jumeirah Lake. It took an extent of five years to get completed and was commercially inaugurated in 2009. This skyscraper of Dubai proudly upholds the title of being the tallest hotel in the world. This lofty plinth has two towers. It stands 355 meters high in the sky with 76 floors that are comprised of 1,608 suites i.e. each tower has 804 units. This iconic infrastructure has 14 different outlets of food & beverage outlets, business center, meeting rooms, conference halls, banquet hall, heal club, swimming pool, spa and gymnasium. The project cost 490 million and got completed in 2013. JW Marriott Marquis is also one of the most expensive hotels in Dubai. This sarsen comprises of 54 floors and stand 355 meters high in the sky. The Emirates Office Tower is also known as Emirates Tower One. This building stands in the same rank with JW Marriott Marquis Dubai Towers, as both have similar heights. Emirates Office also preserves the title of being the world’s 23rd tallest building. The project got completed in 1999 in the span of three years. Being situated on the Sheikh Zayed Road Dubai, Ahmed Abdul Rahim Al Attar Tower is a super-soar skyscraper. Since 2004, the project has been under construction with an undefined completion date by far. The project will serve both for residential and administrative purposes. The Marina Torch is also famous by the names of the Dubai Torch Tower, The Torch and Dubai Torch. This is another loftiest residential & tallest building in Dubai Marina. The Torch won the title of the tallest residential tower in the world in the year 2011 which was later broken by 23 Marina. There are total 504 residential apartments and a 3 level car parking with a capacity of 536 cars. The building that currently bears the title of the 10th tallest building of Dubai is the Rose Tower, which is also known as Rose Rayhaan by Rotana to. This is 72-storey hotel and was considered to be the tallest building in Dubai, between 2009 and 2012. The project successfully accomplished in three years in 2007, however, becomes operational in 2009. These are some of the famous and tallest buildings in Dubai that you should capture in your camera. These buildings are also among the must-visit places in Dubai. If you want to recommend a tallest building in Dubai, please do so by adding comments below.